I officially survived my second Chequamegon 40! This race has been in the back of my mind since I finished it last year. It’s hard to believe it’s already over but I couldn’t be more pumped about my results. I finished almost exactly an hour faster than last year and 917 positions better. In the car ride to the start line with my racing buddies, I predicted my race time to be 2 hours, 37 minutes. I actually finished ten minutes under that. Last year, we opted to start towards the back since it was my first year. This year, we started really close to the front thanks to John and Dave who woke up at 6 a.m. to drop our bikes off. The very front is saved for a select group of riders are awarded a preferred start. The start is a mass start and it’s absolutely insane! It’s hard to explain what it’s like to be packed between 1800 bikes and riders. We start at the Hayward school and ride on Main Street through the town out to the trail. People are lined up and down the street cheering and ringing cowbells. It’s a really unique experience and there is NO room for a mistake! I’ve heard some bad stories about crashes on the start and hope I’m never involved in one! I didn’t expect to start as hard as we did. I wasn’t prepared for the intensity we threw down right away. I struggled mentally the first 30 minutes to hang with the two guys I was riding with; especially knowing it was a 40-mile race! I recovered from the initial sprint and settled into a good pace. I felt good for quite a while then the cramps kicked in. The last 45 minutes of the race I battled with quad cramps but I made it! I’m already dreaming about next year. I feel really bad for my buddy Rob who broke his chain at mile 11 of the Short & Fat. He had to walk the last five miles but he finished which is a huge accomplishment! Overall, it was a great weekend. We camped with a big group of people who we met at Cheq last year and raced with throughout the summer at Buck Hill. There were a lot of laughs at the campfire on Saturday night! Mandi and I found this Huffy Exercise Bike in mint condition on the side of the road near Hermantown on our way to Cheq. John is convinced that pounding a Monster while warming up on this bad boy was the key to his success. 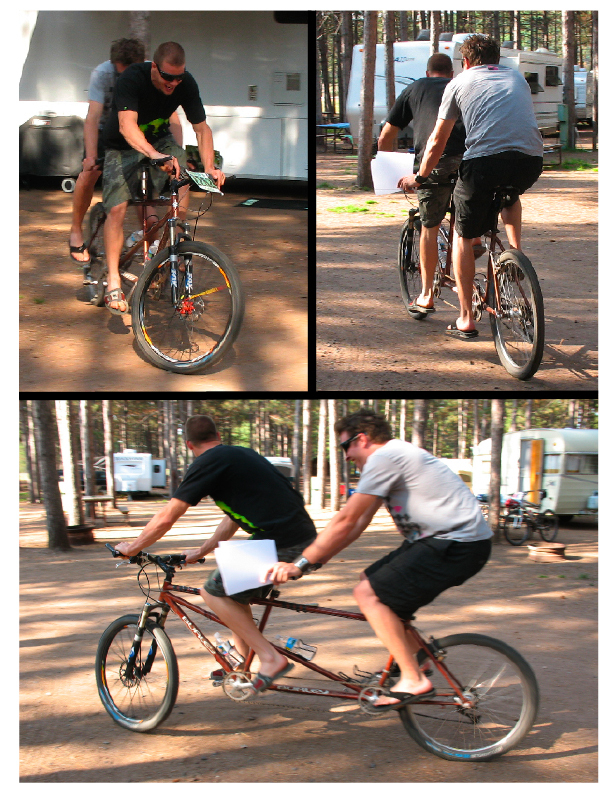 Rob and I training to race Cheq tandem next year. Here’s a quick video of my thoughts pre and post race. I finished up my motocross season on Labor Day weekend at the Steel City National in Pennsylvania. I didn’t reach my goal of a top-ten AMA finish this summer but came really close with a 12-place finish in the second moto at Budds Creek. It was one of the craziest races of my life! I have never seen so much mud and water. I literally saw Monster cans, water bottles and other stuff floating on the track while I was racing. It was unbelievable! If you haven’t seen the SPEED broadcast, you need to. It’s hard to believe that summer is already over but I had a lot of fun racing moto and mountain bikes. I have my final MTB race this weekend and it’s a big one – The Fat Tire Festival’s Chequamegon 40. Last year, it was my first-ever MTB race and I was not prepared. I had no idea what I was getting myself into! My friend John talked me into it and I’m glad he did because now I’m hooked. This year, I’ve been racing, riding and training and feel like I’m capable of a strong finish. I need to thank Mellow Johnny’s Bike Shop for their support this summer and Tyson at Penn Cycle for keeping my bike dialed in. I also need to thank FOX Racing Shox for getting my bike set up with new suspension. Check back next week for pictures and video of the race. Mandi will be the official photographer because she broke her fibula a little over a month ago in a MTB race at Buck Hill. She’s off her crutches and anxious to get back on her bike. She was supposed to be racing the Short and Fat this weekend with my friend Rob. Now Rob is racing the 16-mile race solo but I’m sure the Chief will find his way! After this weekend, I’ll be switching gears to snocross. I’ll make sure to keep you updated on my racing plans. Hopefully snow will be falling soon! My Monster Energy/Castle Replica gear is now available in Castle dealers. Make sure to get your gear soon because it’s selling fast! Also, make sure to check out www.arcticinsider.com. It’s a cool new website where you can get the inside scoop on everything Arctic Cat. Here’s a picture from Hay Days by John Sandberg. Obviously, Garth didn’t think I was funny. 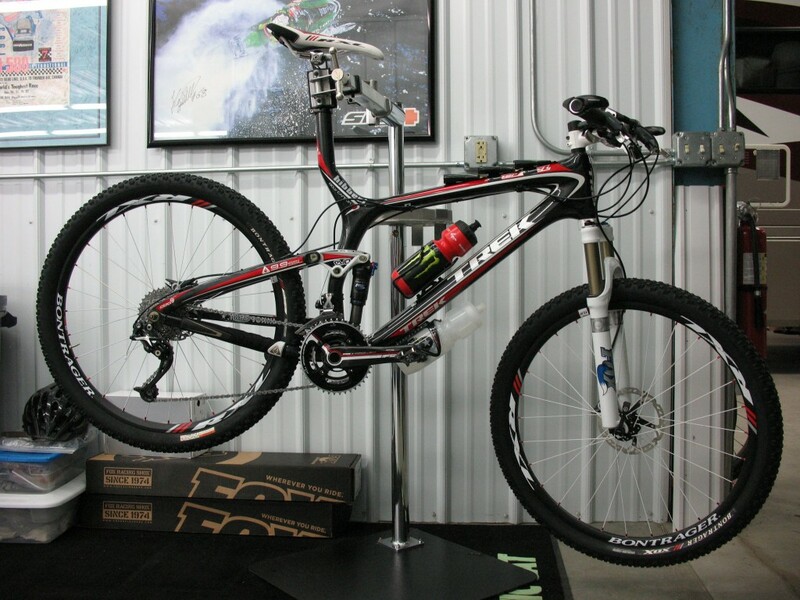 My Trek Top Fuel 9.9 is ready to race…hopefully I am too! When: Saturday, Sept. 12 from 1 to 3 p.m.
For more information on Hay Days, check out THIS website. I think it’s fair to say Tucker ended up having a very dissapointing final race of the season. He struggled to get comfortable on Steel City’s hard-packed, choppy track. For the first time this summer, he ended up not finishing in the top-20 in either moto which means he didn’t earn any points for the weekend. He rode well in the second moto but a first corner crash kept him from breaking the top-20. He didn’t reach his goal of a top-10 finish this summer but I can guarentee this will only make him train harder for next season!